Kimiko always felt fortunate that she knew her grandfather so well. She grew up with him living nearby and he’s been an integral part of her life. She knew some stories from her grandfather’s life but there were many gaps. She wanted to honour him by collecting his memories. She’s his only grandchild and was born 23 days after her grandmother died. A beautiful new life to cherish and play with. He taught her to ride a bike. They built snow ramps in the back yard and loved jumping off the diving board into the lake. So many precious memories. Her grandfather is Japanese/Canadian and was 4 years old when his father died unexpectedly. With 7 children in the family and the world in political turmoil, life was very challenging. 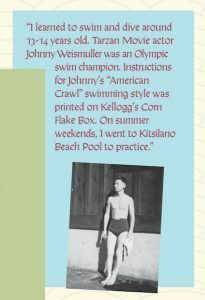 He was 20 years old and working at the private Vancouver Club when Pearl Harbour was bombed. The impact was immediate with a phone call, “You are done here, don’t come to work.” Clearly there were stories to be gathered. I worked with Kimiko to identify questions to ask her grandfather when she did interviews with him. She remembers vividly him saying to her one day, “No one has ever asked me about these things.” By being fully present with him and allowing him to find the stories buried deep inside, she was honouring him in a way that no other gift or gesture had. He was profoundly touched by her desire to truly know who he was. Inside every person is a collection of memories and compelling stories. These stories inform who we are in the world and how we have lived our lives. Here is another hilarious reason about why you want to sit down with older people. The bottom line is they have great stories! You can see a few more images from Kimiko’s grandfather’s story here. When the completed booklet was given to him as a Christmas gift he was deeply touched and the family was so grateful. Kimiko’s grandfather was an enthusiastic supporter of her when she started Miiko SkinCo. I’m a big fan of this company too! I hope you are inspired to sit down with someone you love. I am sure you know someone with great stories, someone you want to honour in a profound way? Or maybe you are a grandparent and wonder if your grandchildren will want to know your stories. I assure you they will at some point be very interested in your life. Send me a note and let’s talk about collecting those memories and stories. If you’ve enjoyed reading this, I would be so grateful if you shared it with a friend. Have a wonderful week.